5 Tips for Bilingual Layout | Language Solutions, Inc. Most translation requests for a bilingual design are not set up in a bilingual layout in the design template/file such as InDesign. We get design files that were already developed in one language and need to be converted to a bilingual layout. The conversion of a single language design into a bilingual design can be performed as part of the multilingual typesetting process by an experienced Language Service Provider but it does entail knowledge of design, not just a forté in typesetting of foreign languages. Our advice therefore, is that bilingual design of the source file should be part of the creative process instead. Bilingual layouts can dramatically impact the integrity of the design and any design decisions should really be made by the original designer. As with anything in translation, if the need for foreign language is known ahead of time, it’s always best to take this consideration into the creation process. You should expect that your Language Service Provider (LSP) should be able to give you tips, but here are some important considerations and 5 tips to keep in mind while you are in the design stage. Designers should always set up a bilingual design with copy for both the source and target language in place (If English is the source, use English text for both places). When you fit in double the content into any design, things get pretty tight. One thing that is often overlooked is that the amount of content often causes readability issues. In certain industries, there are standards that address readability, such as with healthcare. Typically, mailers that are meant to go to Medicare or Medicaid recipients and follow Federal Plain Language Writing guidelines should follow a 12 pt. (Times New Roman) minimum font size to promote readability. Some markets, like Canada, require certain French copy to be equally sized as the source language (see our Francization Services Page about bilingual package design in French for Canada). Because many organizations follow strict protocols for approving copy, any layout issues that requires copy changes might delay the project. It’s up to the project owner to decide how they best like to handle any issues. It can be up to the designer to rework the design, change margins or reduce font sizes. Another decision might be to change the layout to fit a larger template, but that may also change printing or mailing costs. Or it might be that the copy needs to go back to the writers for more concise wording. All these decisions should not be made at the translation stage in bilingual layout, but rather nvolve the many stakeholders in the creative process. If you test out your design using duplicate source copy, one thing that gets overlooked is that many languages either expand or contract in length from the original source based on various factors. Spanish expands by about 25% (from English) as most words use more syllables (therefore, English readability indexes also do not calculate correctly in Spanish – Read about Spanish Readability). Chinese text can look pretty horrible if you don’t account for the fact that the text will typically run much shorter (far less characters), and therefore, you need to account for a lot of white space. Arabic flows entirely different and is probably one of the few languages that requires more collaboration from your trusted multilingual typesetter. One thing your designers could ask from their LSP is to provide some pseudo translations of the source copy to use as a placeholder instead of the source copy – but only for design considerations (See Point #5 below). Not every language can be properly displayed in InDesign without having the right fonts or composer (settings), but your LSP can help you figure out how much more text or less text you need to fit depending on the language. Another idea is to simply flow in, for instance, 20% more copy in English to account for the expansion of your target language. 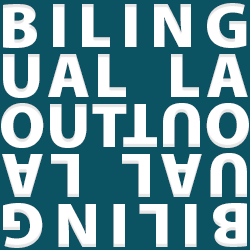 This not only helps to optimize fit as much as possible before bililngual layout, it should also uncover any flow issues that you might have when copying language that is especially longer than the source. Common issues involve text that flows outside of margins or runs in with other elements. Conceptualize your bilingual design by being consistent in the way both languages are organized. The manner in which you separate bilingual text has to make sense. If your reader is constantly confused where to look for their language version of the copy, you will likely not have much success. Typically, copy is either stacked by paragraph or flowed side-by-side. If your copy has a lot of items (for instance the available colors of a product in a catalog), you might need to make each line item bilingual and separate with a character (for instance: black / noir). Choose a character that is not easily confused with copy text. For instance, a forward slash may make sense but if your copy uses a forward slash in other ways, it might be best to separate the two languages differently. The key to a good bilingual layout is to be consistent. For instance, if a header element on one page is separated by stacking both languages and on another page, it is separated in the opposite corners of a spread, that’s not going to help the reader understand how they can navigate through your design. It will impair readability. Color can also be used to separate text, but keep in mind that in certain markets there might be legal restrictions to give one language more prominence over the other. It’s always best to assume both languages need to be equally well represented. Choose one orientation that works best for your bilingual layout with the least amount of issues and work around those other issues creatively. Again, your design decisions should never be the responsibility of your LSP. 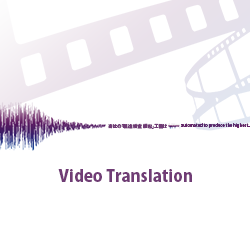 Our job is to make sure the translated text is placed correctly without compromising the integrity of the design. Whether you use stock or are creating your own imagery for your designs, make sure there is flexibility to use them in layout in different orientations. A portrait image that is wrapped around text might need to be landscape oriented to cover (and fit) both languages. Especially when images are narrowly fitted to match the design of the copy, expect issues. If text and images interact (say, a logo with copy or an image that replaces a word), keep in mind also that the order in which that image is represented in another language may not be the same. For instance, placing both Source and Target copy after logo might not work if the target language requires the text to come before the logo (for instance the combination [logo image] brand in Spanish requires a reversal of the word brand to come before the [logo image].) A solid rule for any designer dealing with foreign languages is that it is always best to assume that graphics and text do not grammatically interact the same way as it does in the source language. In these situations, one can either provide source and target with their own graphics so that you can be flexible in both languages or do away with the graphic altogether. Images and Graphics issues are not easy to foresee without actually creating a bilingual layout. Consider that if these issues happen at the translation stage, your project may get delayed while searching for a solution to fit in existing graphics or finding new graphics that work better. Also, if the images or graphics are not suitable for the target market, you may need to re-evaluate your selection, color scheme or even flow of direction when working with bi-directional languages like Arabic or Hebrew. With all this testing and fitting in copy, you might actually forget to finalize the design to represent the desired layout, color, margins, and text that you want translated. Keep in mind that LSPs do not assume that they know what your design is supposed to look like. If your copy is full of magenta colors to indicate the target language, extra time is required to assume the final color of the copy (match English? Different Shade?). It’s easy to make mistakes there as well and color proof everything after the fact. Also, since most LSPs work with translation memory tools, it’s recommended that any bilingual template should contain source copy in both areas (and not the pseudo-translations left in for testing). The source copy in the target area typically is required so that it can be picked up for translation by the software and replaced by the translation once completed. We process most InDesign files in our software to avoid the manual copy/paste process after the fact. Although we suggest that organizations should take control over their own bilingual design, there is value in working together with a trusted LSP to help you along the way. Certainly, organizations are not expected to know how to choose and work with foreign language fonts or set up bi-directional designs (Arabic, Hebrew, etc). However, know that in the process of any bilingual document created from a single language design, there will be design decisions that have to be made that require your designer’s input. 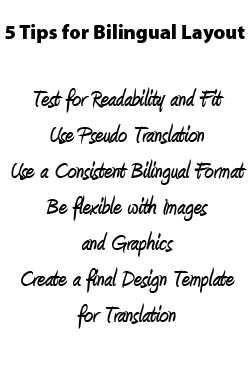 Take the time and effort to get your bilingual design ready for translation by making sure that all design decisions have been worked out before release. It will make for a much smoother and cost effective translation process with a more dependable outcome. Need help with Bilingual Design or Multilingual Typesetting?